Since making their recorded debut in 1993 with a self-titled EP, the Apples in Stereo forged a career in summer-y, sweetened pop music. Founder Robert Schneider, his wife and drummer Hilarie Sidney, rhythm guitarist John Hill and bassist Eric Allen were zealous students of the tradition’s standard elements—brisk tempos, brief run times, fuzzed-out guitars and trebly vocals. Schneider helped start a musical collective called Elephant 6, which included like-minded groups that made jangly music reminiscent of 1960s pop acts, especially as produced by the Beatles and Beach Boys. The innovative Schneider spent much of his time at the band’s recording studio—named Pet Sounds, after the Beach Boys album—tucked away in the alleys of Denver’s Golden Triangle, and forged a sophisticated sound using low-tech equipment. The connection between Schneider’s big ideas and his financial constraints was his peculiar gift for producing and engineering. He supervised albums for some of the bands in the collective, including Neutral Milk Hotel, the Olivia Tremor Control, the Minders, Beulah and Elf Power. “Our obsession has always been the best audio and production quality possible, and we attacked it from the beginning, on our own and together,” Schneider said. “We just didn’t have any resources at all. We were working along at crappy little jobs. Even if we had a good bit of money, we would have done it the same way. We wanted complete control. The Apples used their D.I.Y. beginnings as a launching pad. Sound expanded from recordings made in Schneider’s bedroom to 100-track sonic experiments. The jovial Schneider said the Apples invented their own scene because they were outsiders in Denver’s music community. 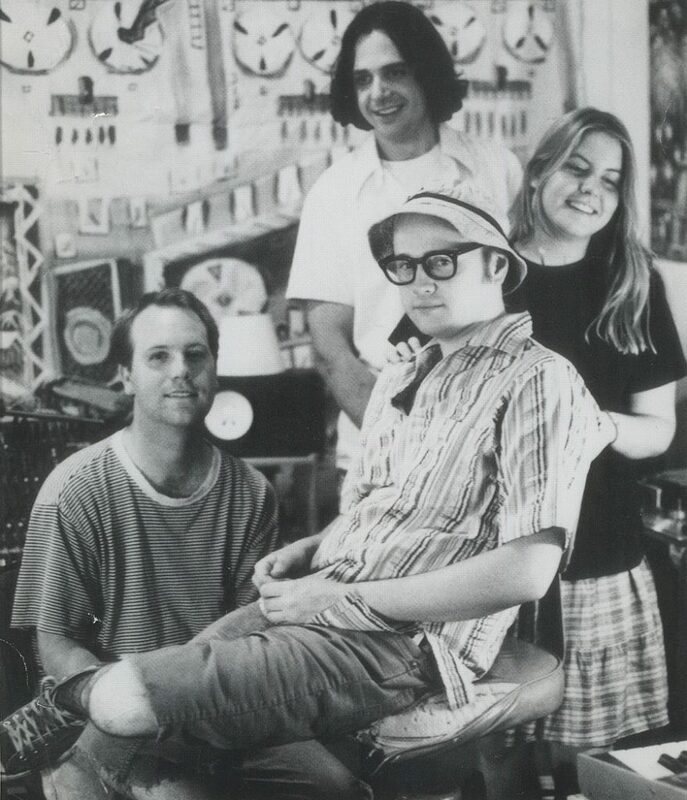 The Apples became well known across the U.S. with write-ups in Rolling Stone, Spin, Details and other national publications and in Great Britain and Japan as an indie-rock institution. They regularly played for packed houses almost everywhere except their hometown. Live, the band’s noisy, grinding distorted guitar chords against trash-can drums created a catchy, loose power-pop romp. The Apples in Stereo’s cute, winsome outlook transformed them into a children’s band when “Signal in the Sky (Let’s Go)” was included on the Powerpuff Girls’ souvenir album and the video aired on Cartoon Network. In the summer of 2001, the band experienced a break in continuity. With their year-old son, Schneider and Sidney moved to Kentucky in pursuit of affordable housing. Allen and Hill, both associated with other local acts (Hill also plays guitar for Dressy Bessy), continued to tour with Schneider and Sidney as the Apples, but they remained in Denver. The members went on hiatus and focused on other projects. When they reconvened, their lineup suffered a blow with the departure of Sidney (since divorced from Schneider) in late 2006; new players Bill Doss (keyboards), John Dufilho (drums) and John Ferguson (keyboards) joined the group. The Apples in Stereo got a boost in December 2006 by the appearance of Schneider on the infamous “Green Screen Challenge” episode of The Colbert Report, singing a typically tuneful ode to Stephen Colbert’s attractiveness and his “number one TV show.” In April 2009, the song “Energy” from New Magnetic Wonder, the band’s sixth studio album, was performed by the contestants on the television show American Idol.